My Twitter cohort Cheri, better known as the Intoxicologist on Twitter, her web page and Facebook, posted a story before the long weekend about labor-free drinks. They constituted cocktails that used only two ingredients. I can’t suggest you clicking that link enough, because there are some very clever, and very delicious concoctions. However, there was one drink that stuck out in my mind, both through it’s associative name and my favorite beer of all time. The Baby Guinness. The Baby Guinness is incredibly simple, hence it’s inclusion on a labor-free cocktail list. It’s two liqueurs. In a shot glass. Since today is Labor Day, a time when take a rest form our labors, I’ll follow Cheri’s lead and make this a labor-free post. Thank you to everyone for reading and supporting! Here’s hoping you had a great weekend, with countless more to come! 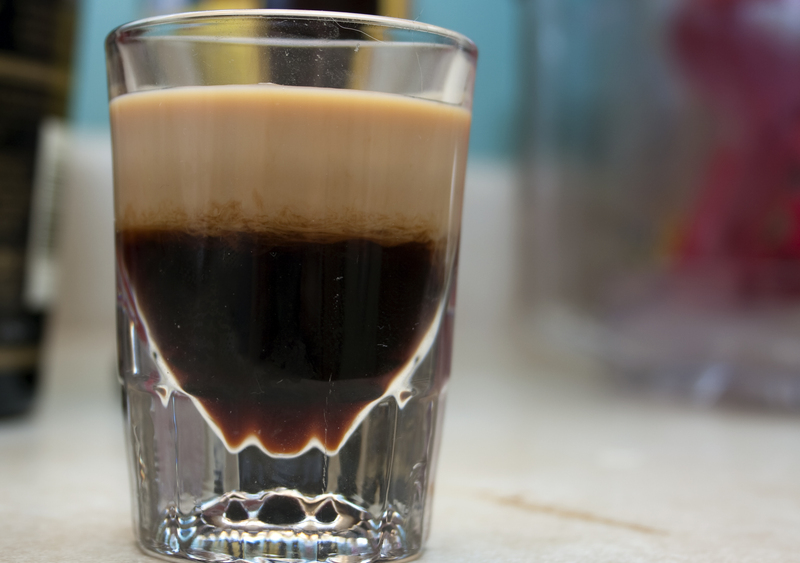 Fill a chilled shotglass halfway with the coffee liqueur. Very gently float the Irish cream over the top of it. Your results should look exactly like a freshly-poured pint of stout. A very smooth and pleasant Irish coffee flavor in shot form. Good to relax and put a bit of warmth in your belly on the “last day” of summer.